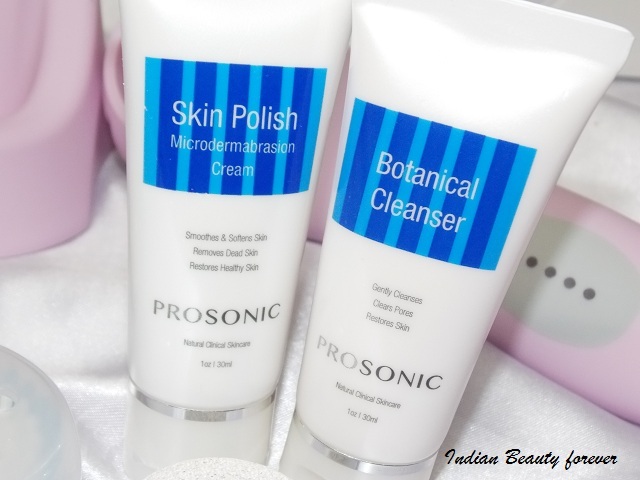 I will review ProSonic kit today that I had received a couple of weeks ago. 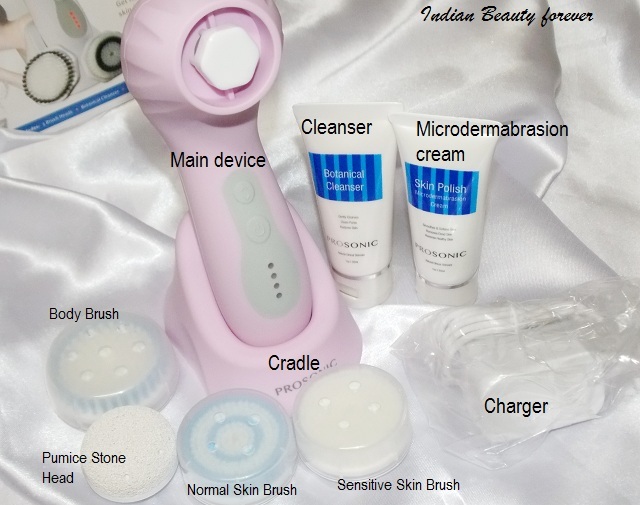 It’s a cleansing and exfoliation system for the body and the face. 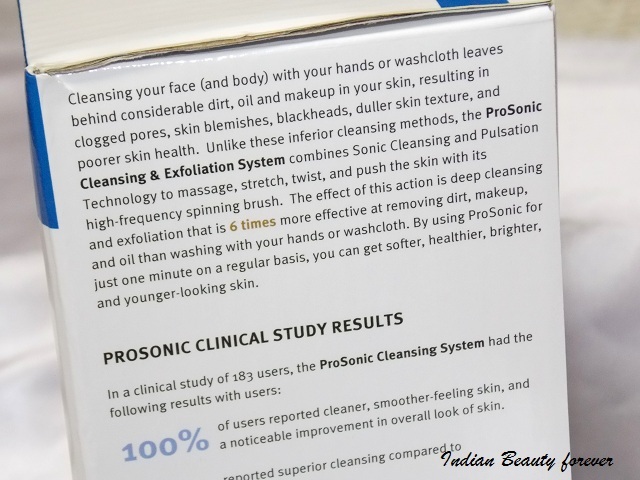 I have heard a lot about such cleansers and their effectiveness in deep cleansing the skin and also the clogged pores that can lead to skin problems. So, when I got it, I was really exciting as well as keen on trying this kit. 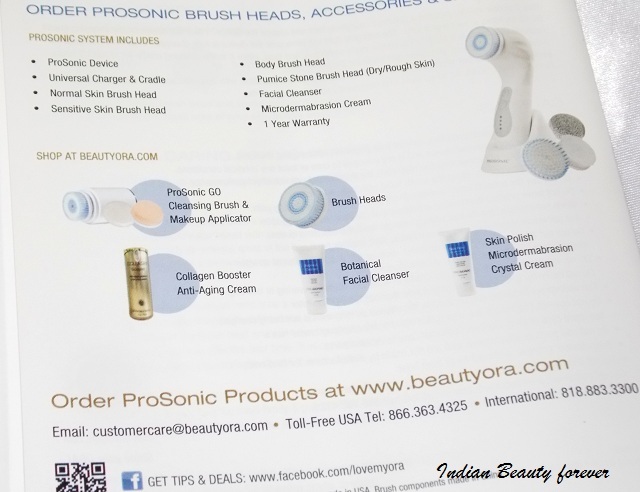 ProSonic kit is priced at $200 and includes 4 brush heads, Botanical Cleanser, Microdermabrasion cream, Universal Charger and the kit comes with one year warranty. It is available in a couple of colors like pink, lavender, white. I got this Pink one. You can also buy it on ebay.com for lesser. 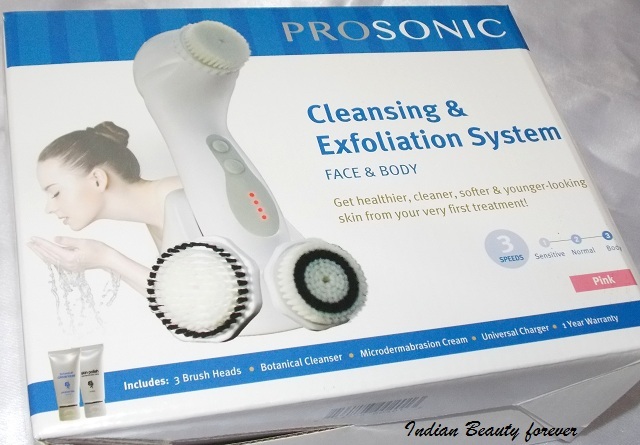 ProSonic Claims “ProSonic Cleansing and Exfoliation System combines Sonic Cleansing and Pulsation Technology to massage the skin with its high frequency spinning brush. The effect of this action is deep cleansing and exfoliation that is 6 times more effective at removing dirt, makeup and oils, than washing with your hands or a washcloth. 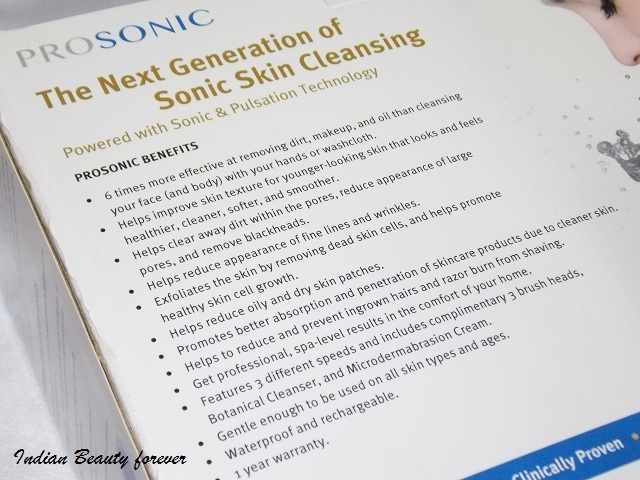 By using ProSonic for just one minute on a regular basis can give you brighter, healthier and younger looking skin. You may read rest of the details from the pictures!! 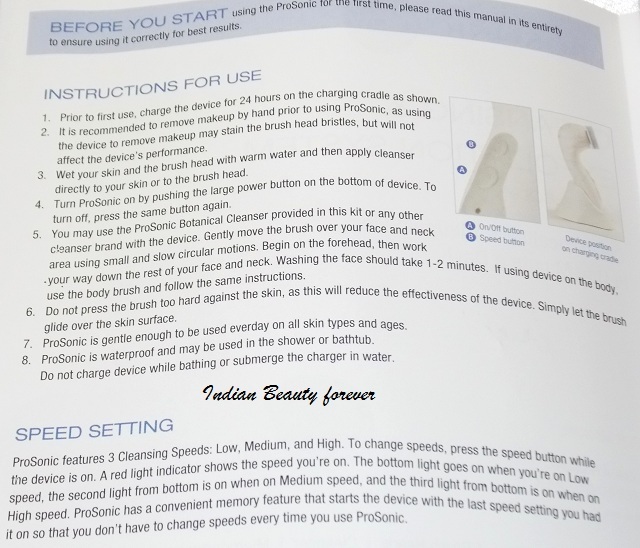 The main ProSonic device has an on and off button and three speed levels that you may set as per your skin type, if your skin happens to be sensitive, use the lowest speed or for the rough body skin, using the highest speed is recommend though it’s all up to the user who can further adjust the speeds as per the brush head that is being used. Experience: I started with the white brush head that is meant for the sensitive skin even though my skin isn’t that sensitive and kept the speed on the lowest. I splashed my face with some water and applied some cleanser with my fingers, then gently used the ProSonic in circular motions over my face. It says that it should be used for a minute or two for the face, which is what I did. Moreover, I concentrated on my T zone more as my nose and chin becomes very oily and more prone to clogged pores. My nose has a couple of pores that needs to be cleaned properly else, I can end up getting a huge pimple out there and then, the treatment, redness, scarring etc. therefore, My nose is something that I had to take extra care of apart from my rest of the face. Those of you who have oily to combination skin, can relate to this problem. My first impression when I saw my face after using this cleanser was okay. My face looked bright and smooth to touch but nothing that is too overwhelming as similar effect or results can be achieved by using regular scrubs. But after using it for the past so many days, I can feel the difference, the pores on my nose where reduced and as they were not clogged. The whiteheads that I get were fewer and can notice that with every passing day they are going. I could have done the same by using a washcloth or hand head brush as well but the pulsation vibrations that you feel while using this is, I guess what sets it apart. The vibration device exfoliates gently yet effectively and gives the face a mini massage due to which face becomes relaxed with improved blood circulation. This is what I felt can be the reason of the brighter and glowing skin. I have not used their cleanser as of yet as I am using from some other brand but the Microdermabrasion cream is something I wanted to and have used it once. It’s a crystalline grainy thick cream that is more like a scrub and gently peels off the outer dead skin layer to reveal a glowing skin underneath that has lesser scars and lines. Though you need to be careful while using any such product and while stepping out in sun, do wear a physical sunscreen to protect the new skin that you have revealed with the help of this Microdermabrasion cream. Apart from the face, it can be used in the same way for your body as well, though I have used that in shower for only twice and it fared well just it did for the face. There were tiny bumps at the back of my upper arm and that area has seem to become smoother after that. I am not using it in shower as it may take some extra time as there is a large area to be covered and while I am in a rush, this is just not possible but it can be used at specific parts where you have problems like ingrown hair, bumps etc. Rather that that I use the Pumice stone head for heels every other day. 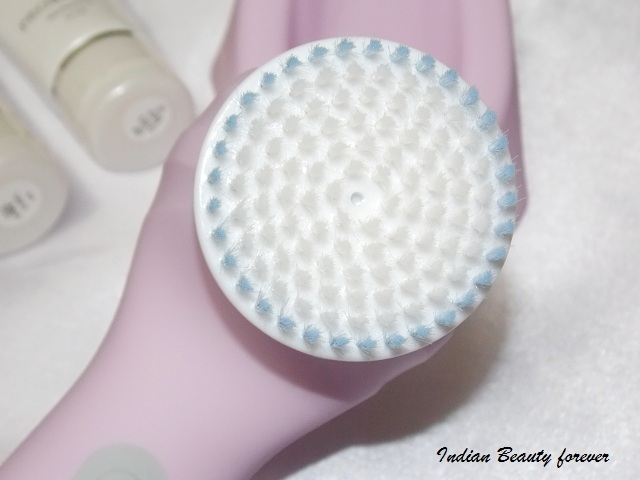 The design of the brush head makes it really easy to be used on the contour of the heels. To charge the device, you have to put the handle into the cradle. Cradle further needs to be attached with the charger and it will get charged. The device is waterproof and can be used in the shower but while taking off and putting on the brush heads you do not need to twist, simple push and pull. 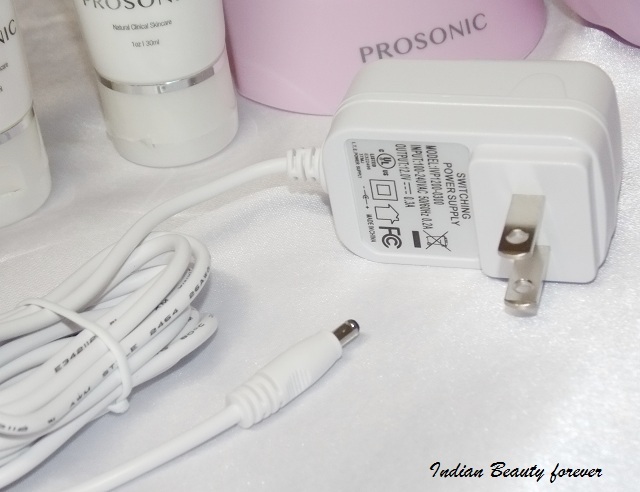 I have just one concern here that the charger that comes along is not the regular kinds that we seen in India. So, I asked my brother to do something about it, which he will by getting a extension board that can accommodate the flat pins of the adapter. Pulsating vibrations boosts blood circulations and gives a mini facial massage. Gets rid of bumps and ingrown hair that further helps smoother shaving experience. 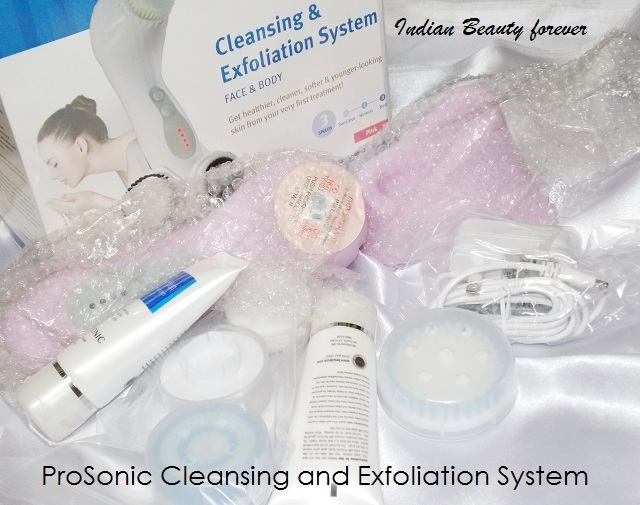 Take: ProSonic Cleansing and Exfoliation system is an easy to use kit that comes with four brush heads designed to suit skin type and different speed settings in primary device. It cleans, exfoliates and gives a gentle massaging to further improve the blood circulation. It is suitable for daily use to reveal a healthy and clear skin. PR sample sent for consideration.